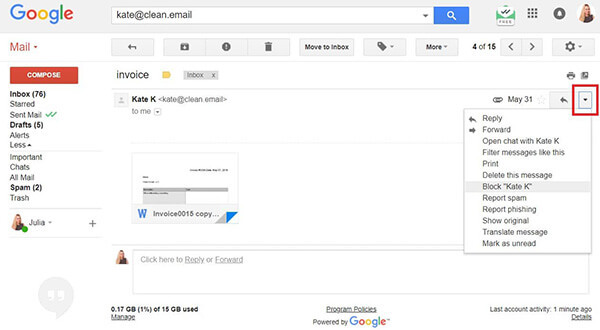 In this article, you’ll find step-by-step instructions that explain in detail how to block an email address, and you’ll also learn how Clean Email, a modern email cleaner, can help you manage your mailbox. Because email spam has reached alarming numbers, with about 14.5 billion spam emails sent every single day, many people wonder how to block an email address in Gmail, Yahoo, Outlook, and other email service providers. Open an email from the sender you would like to block. Click on the little arrow next to the reply button and select the “Block [sender’s name]” option. A pop-up window will appear and ask you if you want to block the sender’s email address and move all future emails from it to the Spam folder. Click on the Block button to confirm. A confirmation message should appear, telling you that you’ve successfully blocked the sender. Should you ever decide to unblock the sender, simply open any email you’ve received from it, click on the little arrow next to the reply button and select the “Unblock [sender’s name]” option. If you can’t find any message from the sender, click on the Settings gear icon and select the Settings option. Go to Filters and Blocked Addresses and select the email address you would like to unblock. The problem with spammers is that they often keep randomly generating new email addresses, forcing email users to block each new spam email individually. It probably won’t surprise you much to learn that many people simply give up after a while and live with an inbox full of spam emails. Click on the triangle located on the right side of the search bar. Type the desired email address under From. Keep in mind that you don’t have to type the entire email address and can enter only the domain name. Click on the “Create filter with this search” option, which is located on the bottom-right corner and can be hard to see. 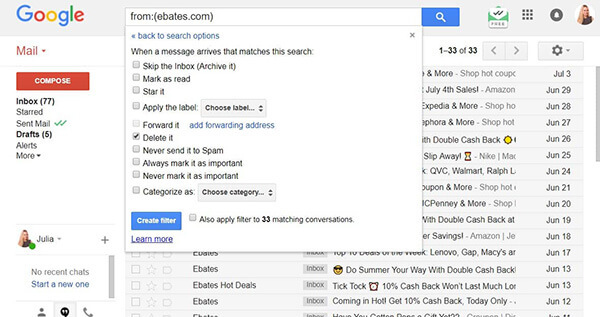 Check the “Delete it” option to automatically delete all emails from the desired email address. Hover the mouse cursor over the settings icon and select the Settings option from the pop-up menu. Navigate to the Blocked Addresses category. 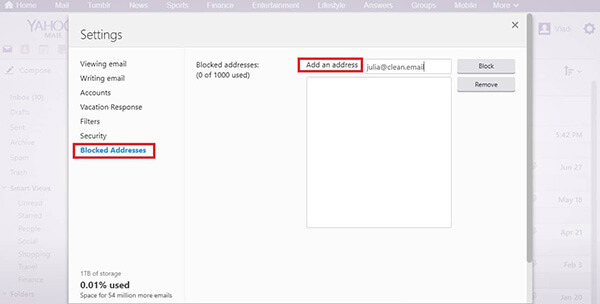 Under Add an address, type the email address you would like to block. 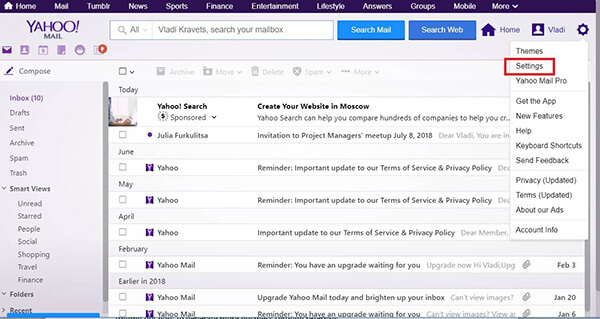 To unblock an email address on Yahoo, you simply navigate to the Blocked Addresses category again and choose which email address you want to unblock. Select any email from a sender you would like to block. Click on the down arrow next to the forward button. Confirm your choice by clicking on the OK button. 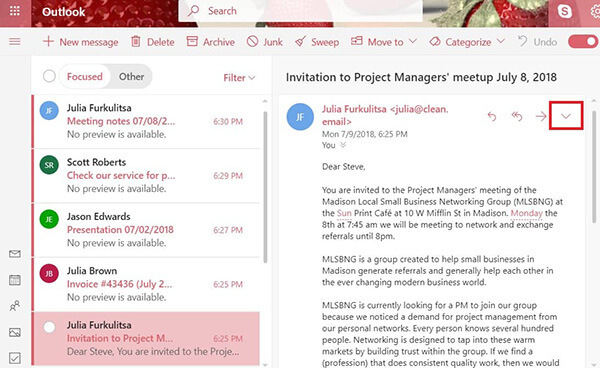 If you would like to have more control over how Outlook.com handles incoming email messages, open the Settings menu by clicking on the settings icon and selecting the View full settings option. There, you can create complex rules to tell Outlook how to handle incoming email messages. For example, you can block all emails coming from a certain domain, or you can automatically move all marketing emails to a separate folder to separate them from important personal and business emails. Even though one of the most secure email providers ProtonMail uses a smart spam detection system to automatically block spam email messages, sometimes junk emails get through anyway. When that happens, the best defense is to block the sender using ProtonMail’s filters. Go to your ProtonMail inbox and click on the Settings option located in the top-right corner. From the menu on the left, select the option entitled Filters. There, you can mark specific email addresses as spam. 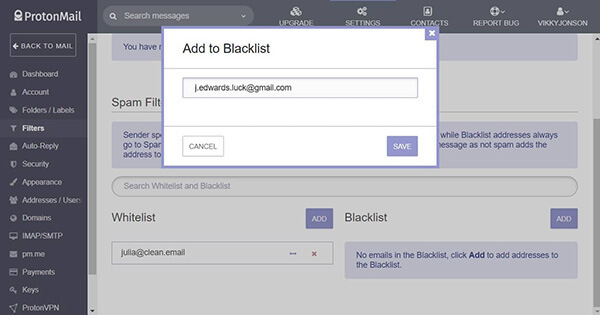 Type the email address you would like to block into the filed under the Blacklist section. 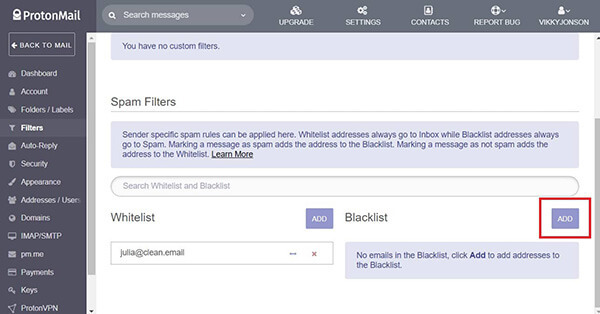 You can quickly move email addresses from the Blacklist to the Whitelist using the Switch button, which is located next to the Delete button on the email address listing. As you can see, major email service providers give you a range of options how to block email addresses and stop spam. However, there are many email services that don’t offer nearly the same range of options as Gmail, Outlook, Yahoo, and ProtonMail do. Even if your email service of choice doesn’t allow you to easily block unwanted emails, you can always apply any action to new emails coming to your mailbox without any manual work with Clean Email’s automation features. 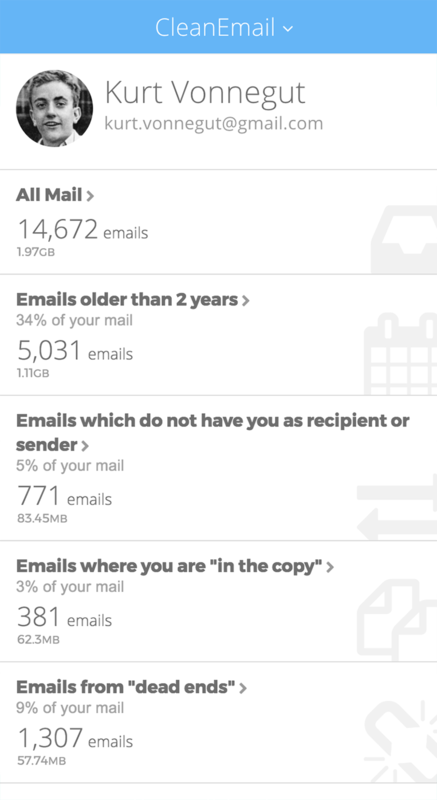 For example, you can automatically delete all marketing emails, move notifications from Twitter to a separate folder, or mark all new emails from a certain sender as read. 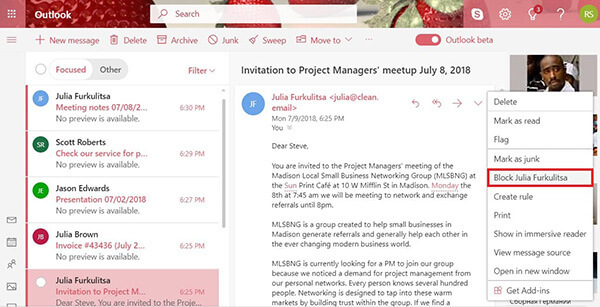 To learn more about Clean Email and all the different ways how it can help you organize, group, remove, label, and archive your emails, visit its Help section and sign up for free. 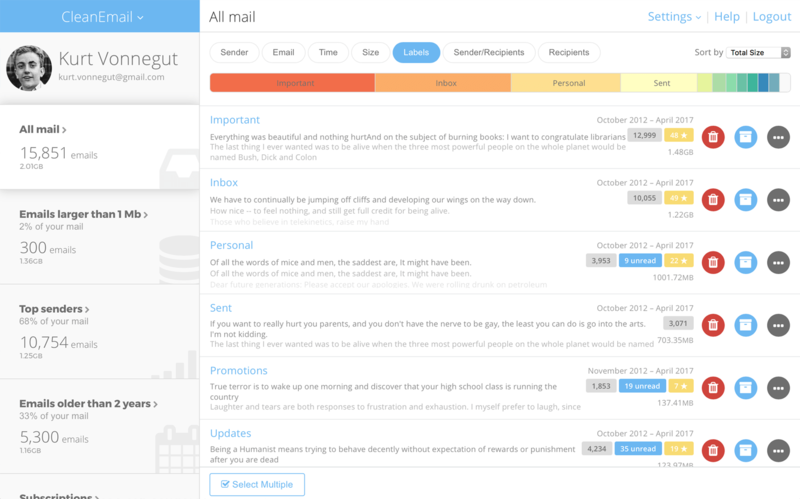 Clean Email has web version, app for iPhone and Android. Most major email services make it possible to block unwanted email messages and prevent them from reaching your inbox, with some services making email blocking easier than others. But regardless of what email service you use, you can always organize all of your emails with a few clicks and apply complex automation rules just as easily with Clean Email.